Dear visitors, welcome to the Land of Smiles, Smirks, Giggles and General Mayhem. Those of you who visited the Chiang Mai city 10 or 20 years ago will recall that the airport used to be outside the city. Not any more! 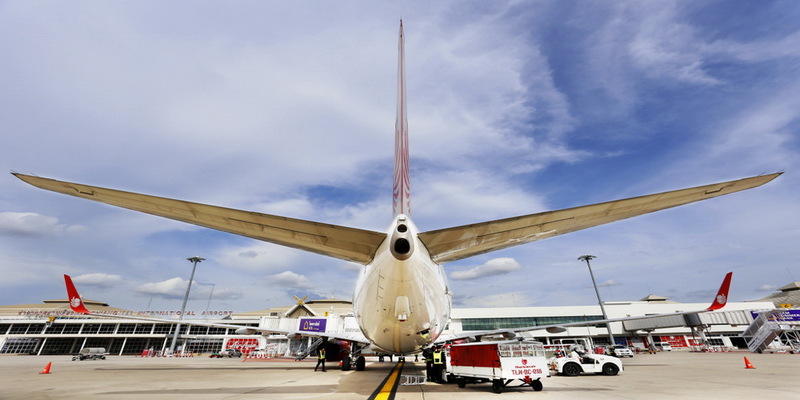 Chiang Mai has expanded and grown so much that our international airport is now practically in the city centre. So first things first: if you have just landed, you’ll be needing a taxi. And it is nice to know that your hotel is probably little more than 15 minutes’ drive away. Three or four taxi counters are inside the terminal; prices should all be about the same. Airport taxi to anywhere downtown is 150 baht. For rides outside the ‘metropolis’: 50 baht as soon as you get in the cab, then 50 baht for the first two kilometres, and 10 baht per km thereafter. If you want fix a price beforehand, you will have to check the chart at the airport taxi counters (it’s usually 180 to 350 baht). (air-conditioned van) is available at Gate 9. Just 40 baht per person. Route 2: Airport- Night Bazaar. Shuttles run 7 a.m.-9.30 p.m.
trucks (known as songtaew) are sometimes waiting at the exits or outside the airport. Price is about 40-60 baht. 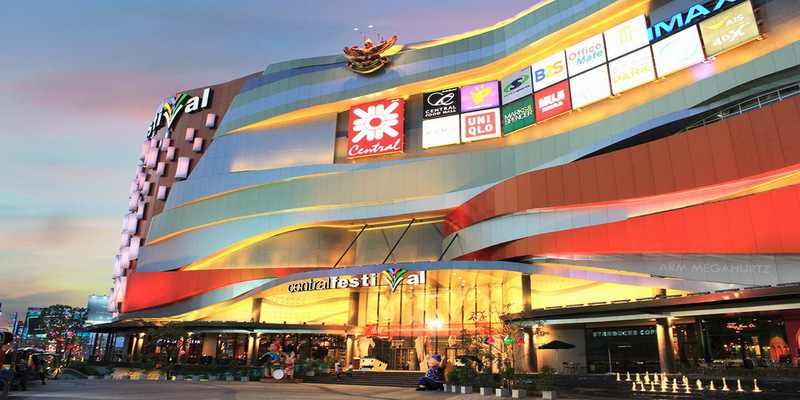 Central Kad Suan Kaew Plaza, Huay Kaew Rd. 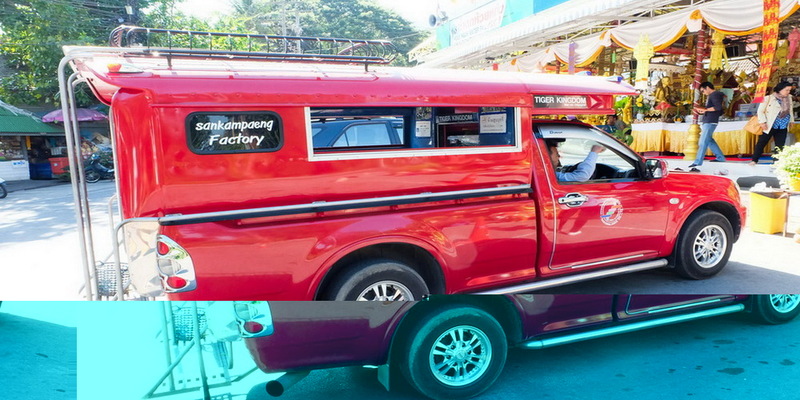 There are about 2,000 Red Cabs (pick-ups or songtaew) available throughout the city. Price starts at 20 baht. White Cab (No.12) is available in Chiang Mai downtown only. > is 15 baht. Purple-White Cab runs Chiang Mai – Lamphun (base station Warorot Market). Price is 12-40 baht. Call (083) 325 4965. Blue Cab runs Chiang Mai- Doi Tao district (base station Warorot Market). Price is 15-40 baht. Orange Cab runs Chiang Mai-Fang (base station is Chang Puak : Bus Station). Price is 15-40 baht. Yellow Cab covers three routes: Chiang Mai- Mae Rim; ng Mai- Doi Saket; and Chiang Mai- Chom Thong. Mae Rim and Doi Saket cabs start at Warorot Market while Chom Thong cabs run from Chang Puak Bus Station and Wua Lai Road (Chiang Mai Gate).